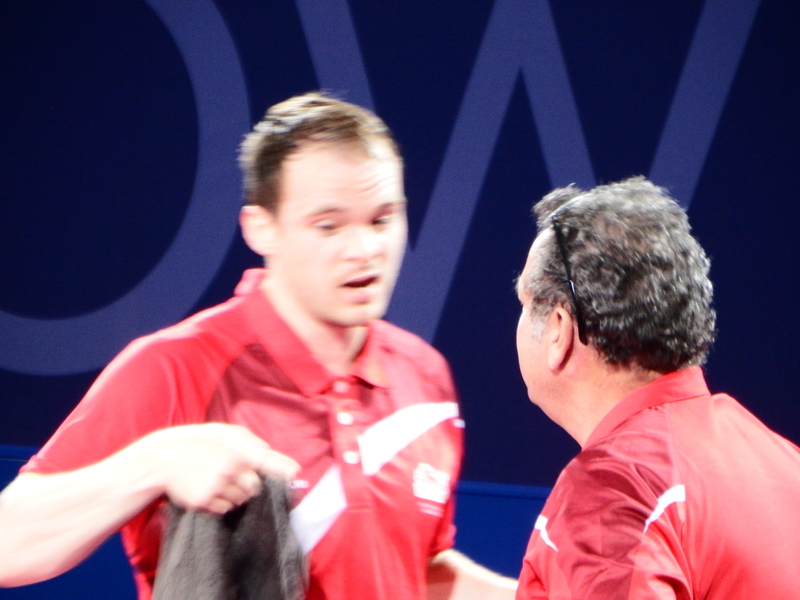 Whoever decided that the way to select St Andrews TTC’s Swots and Prospects team places for the forthcoming season was to hold a play-off tournament, could not have imagined the tension, the tears, the joy, the shocks and the drama that unfolded in Victory Memorial Hall on 18 August 2014. As the Swots is the more highly ranked team, the prize was securing one of the three coveted places in the Swots’ squad. 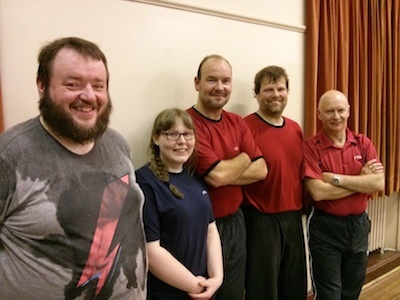 The five contenders, Collin Bleak, big Dave Goddard and Emma Bissett (the trio of Swots from last season) and the not so young pretenders, wee Dave Beveridge and Robert Brown (both from the Prospects), had been anticipating the night for weeks. But it didn’t go the way that most pundits expected. Collin’s first match with Robert witnessed a thrilling narrow victory for Collin in five games. On the other table, Emma started with a surprisingly easy 3-0 triumph over wee Dave who had squandered a 10-5 lead in the second game. As the evening unfolded, Emma continued to confound the form book by demolishing all the crumbling men before her with a display of superbly controlled table tennis – and she duly bagged first place on the Swots’ team. After both wee Dave and Robert had picked up wins against big Dave (another five game match for Robert) the drama really unfolded. Collin usually gets the better of wee Dave but he has developed an allergy to one of his ‘nothing’ serves. Mathematician Collin reckoned that serve cost him 12 points in the first two games but, by the time he’d worked out how to return it on the table, the match was lost 3-1. The two remaining places in the Swots team would be decided by the final two matches. Collin took his wins to 2 with a fairly routine three game victory over big Dave who was now out of the reckoning. Robert was meanwhile battling with wee Dave (by now also on 2 wins) both knowing that they had a fighting chance of a top three finish. The permutations were complex. A win for wee Dave would land him and Collin in the Swots; a heavy loss would favour Robert and Collin. Robert took the first two games comfortably and led 9-3 in the third game. At this stage wee Dave was feeling sick but he wasn’t finished yet. Dredging up all of his remaining willpower (school motto, Perseverando) Dave fought back to take a marathon third game 18-16 and then the fourth 12-10 only to lose the match 10-12 in the fifth. So what did it mean? Robert, Collin and wee Dave each finished with 2 wins, but on a count back of games won and lost in their encounters with each other, Dave had a 5:4 ratio, Robert 5:5 and Collin 4:5. It was that close. Sporting outcomes are often decided by the finest of margins. But Robert and Dave were not complaining as they secured spots alongside Emma on the Swots. The final mention and thanks go to Elaine Forbes, who superbly organised and umpired the competition, and to Howard Lee who generously gave up his practice night to umpire on the second table. This entry was posted in Uncategorized on August 19, 2014 by standrewstt. 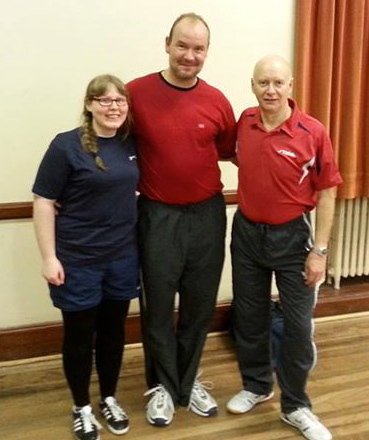 St Andrews Table Tennis Club has been awarded over £2300 in lottery funding. The Big Lottery Fund, the largest distributor of National Lottery good cause funding, is responsible for giving out 40 per cent of the money raised for good causes by the National Lottery. The Fund is committed to bringing real improvements to communities and the lives of people most in need and has been rolling out grants to health, education, environment and charitable causes across the UK. Since its inception in 2004 it has awarded over £6 billion. The money for St Andrews TTC has been provided to help the club develop its coaching programme for youths and adult beginners/returners, and to replace essential equipment. 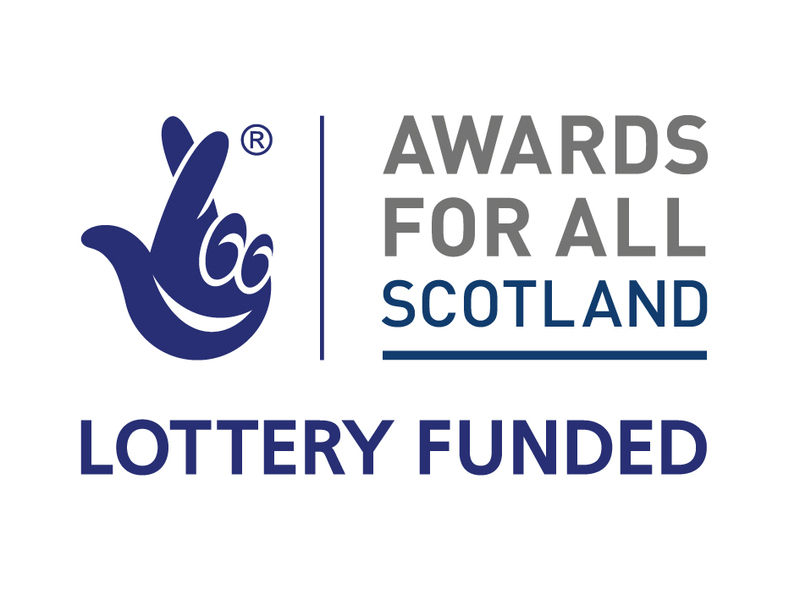 Awards for All Scotland determined that the club’s application successfully satisfied the criteria of ‘People and communities are healthier’ and ‘People have better chances in life’. Club Chairman, Neil Lea, commented, “The club has several qualified coaches and provides a safe environment in which youngsters can learn the basics of table tennis in a friendly and encouraging atmosphere. We would love to see more youngsters progressing to play competitively in the leagues. We are also finding that table tennis is increasingly popular with the older generations and it’s never too late to take up the sport. Several of our more ‘mature’ members will testify to the benefits to their health from playing table tennis”. The club has several vacancies in its youth session and would love to hear from parents about any youngsters that would like to join in. The youngsters meet on Mondays from 5:15pm to 6:30pm in the Victory Memorial Hall, St Andrews from the start of September. A new session, led by former Scotland internationalist, Elaine Forbes, will also be established from mid-October on Tuesday evenings, targeted specifically at adult beginners and returners. For more information or to register an interest in attending either session please contact the club through this website or phone (for youngsters) Howard Lee, on 01334 828694 or (for adults) Elaine Forbes on 07790 924698. This entry was posted in Uncategorized on August 5, 2014 by standrewstt. 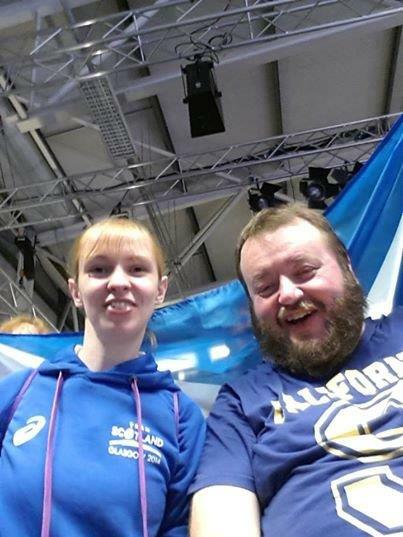 Emma Bissett and Alain Leger joined six of last week’s intrepid travellers on Friday for another day of Commonwealth Games TT at the Scotstoun Campus (not to mention local TT enthusiasts Elaine Forbes, Jim Brown, Carol McLean, Richard Tough and Fiona Kinloch who were also spotted in the crowd). 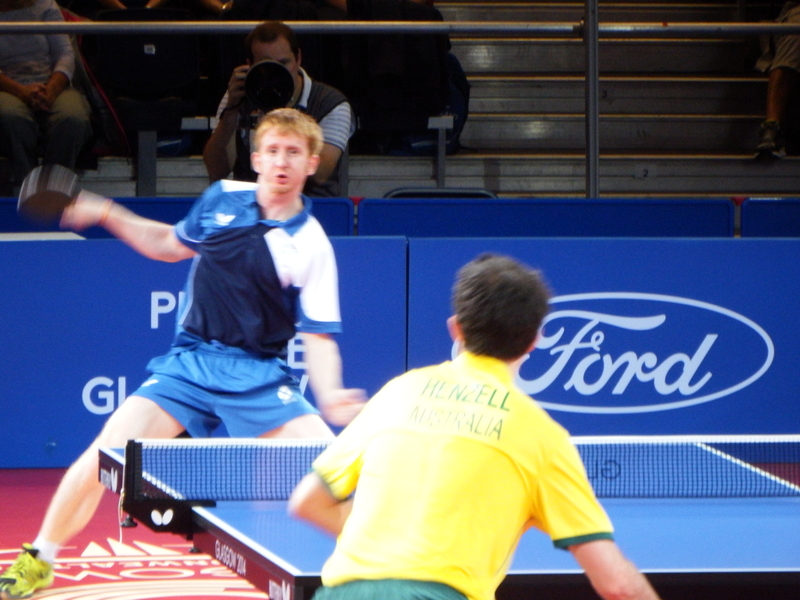 Support was strong and vocal for Scotland’s Gavin Rumgay as he faced Australian number one, William Henzell in the 3rd round of the men’s singles. Rumgay has a well-deserved reputation for his extrovert celebrations that excite the crowd and intimidate the opponent. Playing a defensive blocking game, Rumgay caused Henzell a few problems but this strategy turned out to be too passive and the Australian eventually prevailed. At least we didn’t have to witness the now infamous Rumgay wedgie. 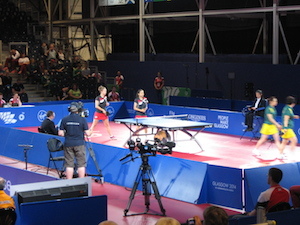 During the Rumgay match, the crowd were partly distracted by some spectacular looping rallies on the neighbouring table as England’s Paul Drinkhall took on Ryan Jenkins from Wales. Jenkins has some powerful top-spin shots and the attack-minded Drinkhall found himself forced to defend with some high lobs from the back of the court. 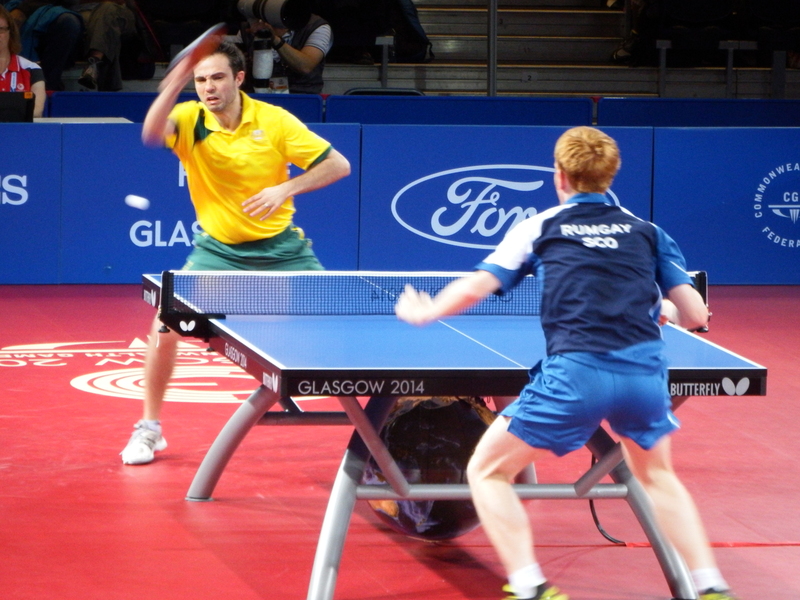 Drinkhall prevailed 4-0 in a feast of table tennis but it was much tighter than the scoreline suggests. Singapore have the best technical players in the tournament but they typically show little emotion (with the exception of the streaky blond Li Hu). 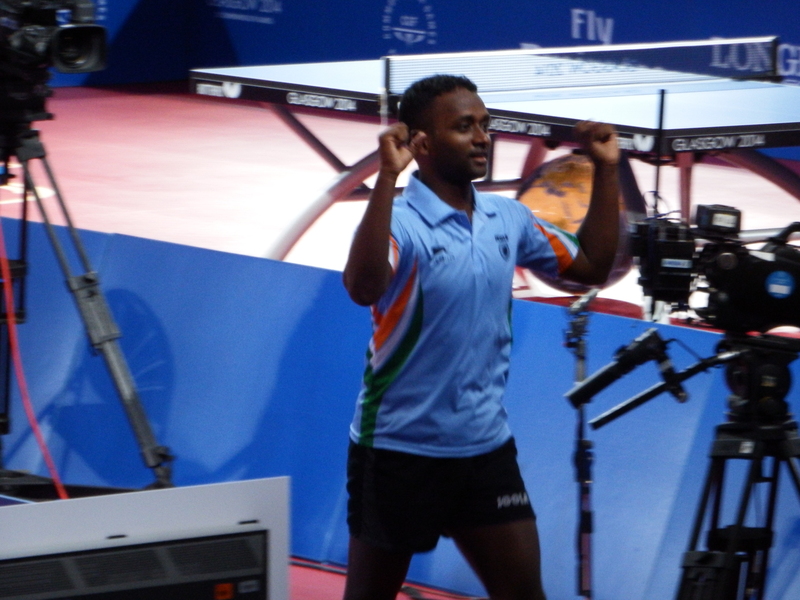 In contrast, it was terrific to see Anthony Arputharaj go ballistic after helping India to a surprise win over the Singapore’s men’s doubles pair. Tony’s celebrations started with a leap onto the table at the end of the match which was something to behold – but not to be copied. He seemed pleased with his win! 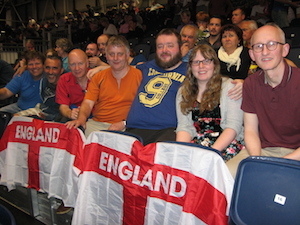 The day climaxed with the simultaneous involvement of three England teams in the semi-finals of the mixed doubles. The St Andrews’ contingent was uncertain which table to look at. 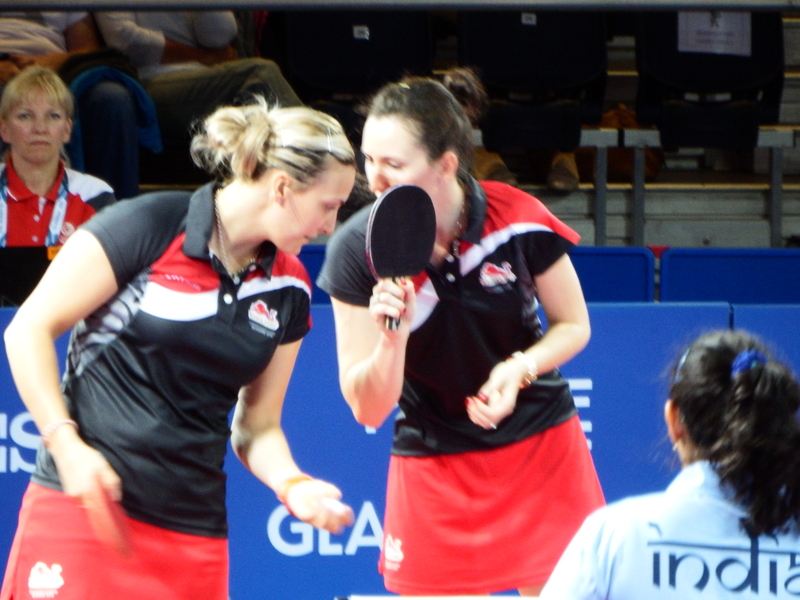 It hardly mattered as both matches were entertaining and closely fought as married couple (and eventual gold medalists) Paul and Joanna Drinkhall ultimately overcame Kelly Sibley and Danny Reed in a tense five set thriller. 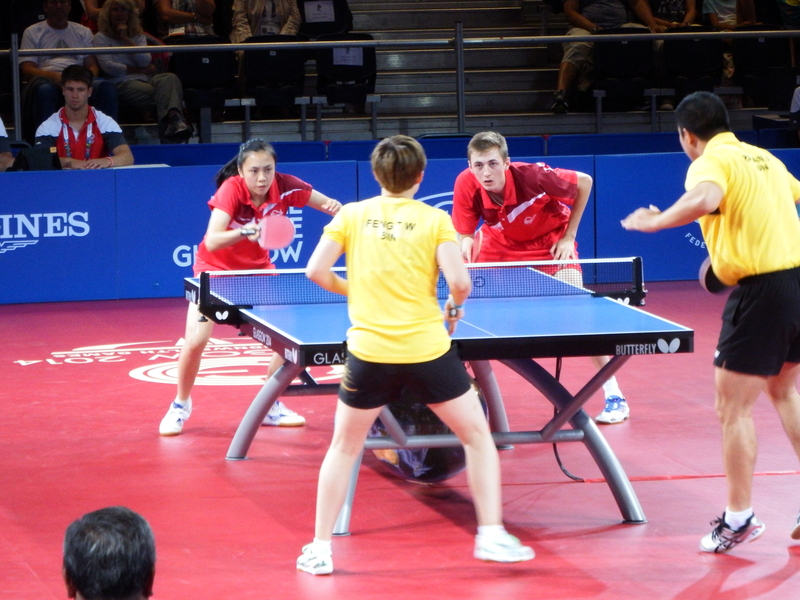 On the other table, the youthful duo of Liam Pitchford (ping pong’s Peter Crouch) and 15 year old Tin Tin Ho (now officially adopted as the St Andrews club’s mascot) dramatically defeated the favourites and number one seeds from Singapore. Unbelievably, even our ‘Scotch’ boys were seen enthusiastically waving the cross of St George in support of the sassenachs. Emma (raised in Kinross) was heard to shout, ‘Come on, England’, while Dave (raised in Leven) was rumoured to have joined in with a chorus of, ‘Let’s go England, let’s go’, although he later denied it. The picture below provides evidence of our support for England (the chap who offered to take the photo asked us where we were from. He was a bit suprised by the answer, “Scotland”). 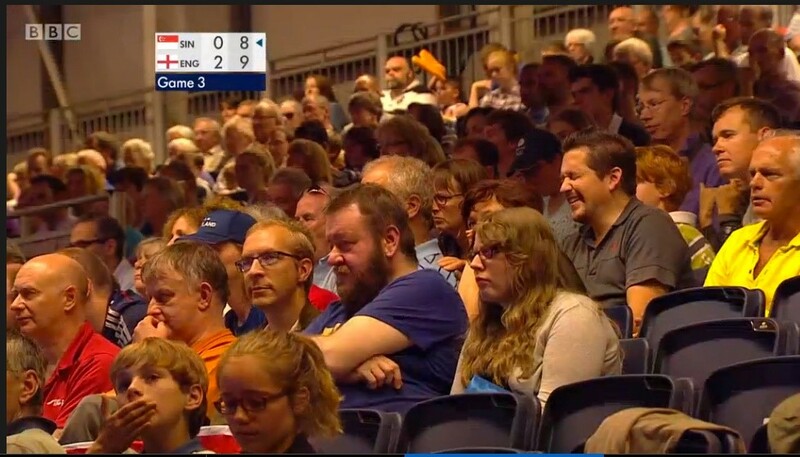 Our delight was complete when we discovered that we had been picked out in the crowd by the BBC cameras (see the photo below). Even the delayed train journey home in sauna-like conditions couldn’t dampen our enthusiasm after another terrific day of world class ping pong. This entry was posted in Uncategorized on August 4, 2014 by standrewstt.